This couple's long-term planning for a lake house is about to come true. 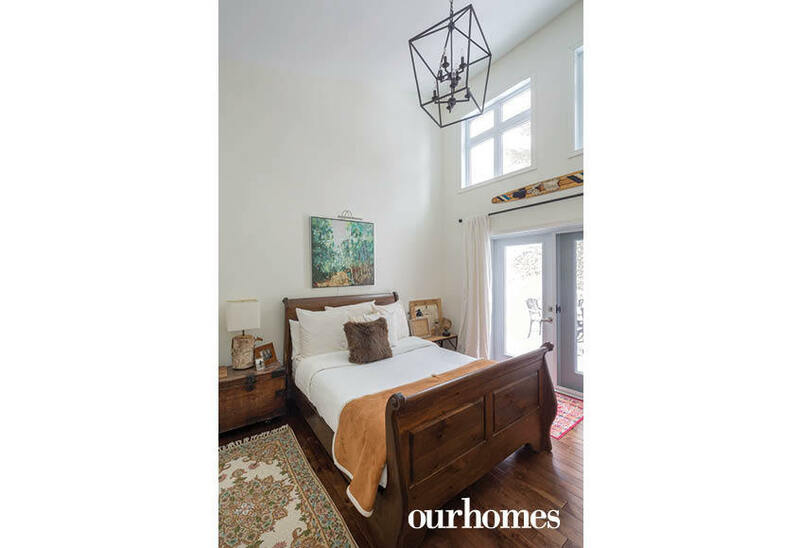 A version of this article originally appeared in the Fall-Holiday 2018 issue of OUR HOMES Peterborough Kawartha Lakes Cobourg Durham Region Port Hope, p.22. Find Find local businesses in our Peterborough directory. 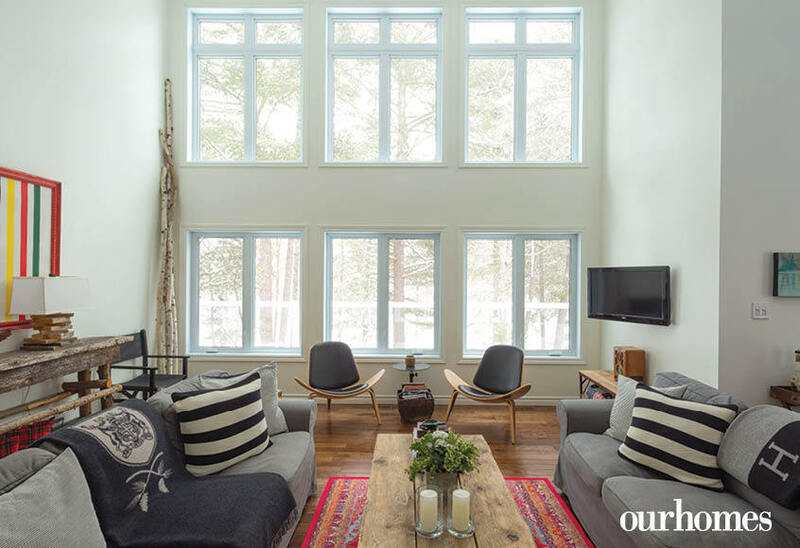 Deciding they would need a home, not a cottage, they found a property on Stoney Lake and started building their customized home by Beaver Homes and Cottages from Chemong Home Hardware Building Centre in 2012. Rising from nine to 21 feet, the sloped ceilings, combined with white walls and a curtain of windows that spans the water view, make the home airy and bright. In 2017, they completed their chic, black and gold kitchen that features a leathered granite countertop from Delray Granite. The 1,300 sq. ft. home has three bedrooms, a laundry room, a three-piece main bathroom and a two-piece bathroom off the master bedroom. Long before they started to build, Joanne imagined every room. “I like putting things you wouldn’t expect to see and pairing them up,” she says. “It’s all about the juxtaposition of things.” Edgy, upholstered armchairs with wooden legs sit nearby mid-century, black leather-seated shell chairs. 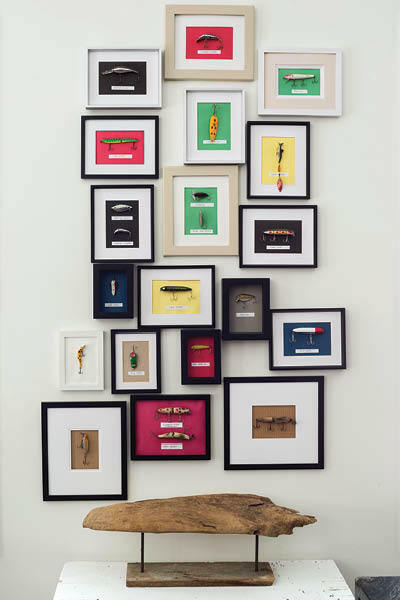 Joanne created a fishing wall in the kitchen by mounting lures on coloured paper and framing them. Some are vintage, others are retired favourites or gifts from family. The fishing wall not only adds a pop of colour, but also acknowledges the importance of fishing to Rich. “There’s a bit of everybody here,” says Joanne. Aiming for a mix of new and old, precious, purposeful and personal, the couple have achieved the space they imagined. Heirlooms like a Singer sewing machine that belonged to Joanne’s grandmother and wartime keepsakes from Rich’s grandfather are lovingly sprinkled into the décor. 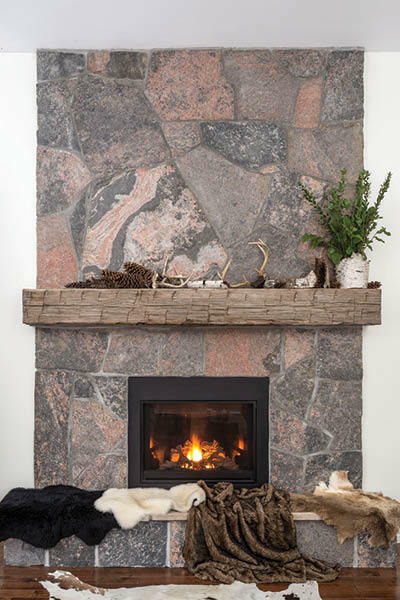 Antlers, acorns and birch branches bring the outdoor element in. 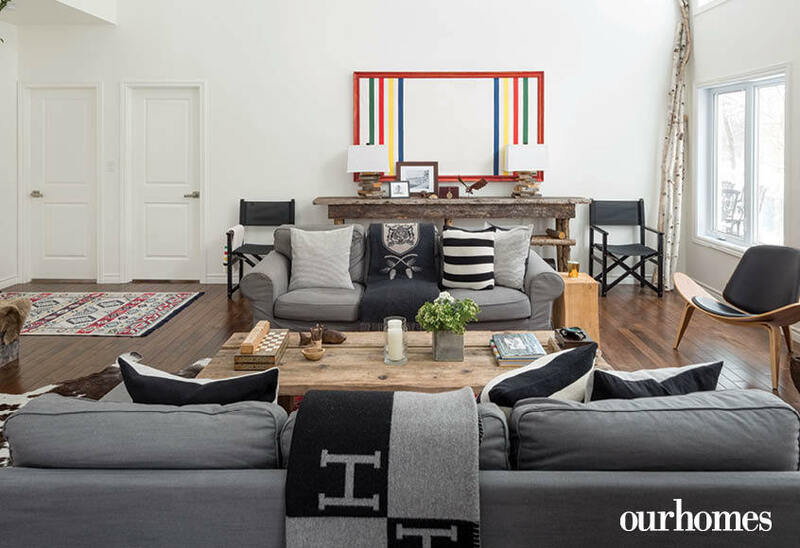 Handcrafted furniture like the console Rich and Joanne’s dad constructed from old fence boards from her family’s home not only warms the space, but also the heart. 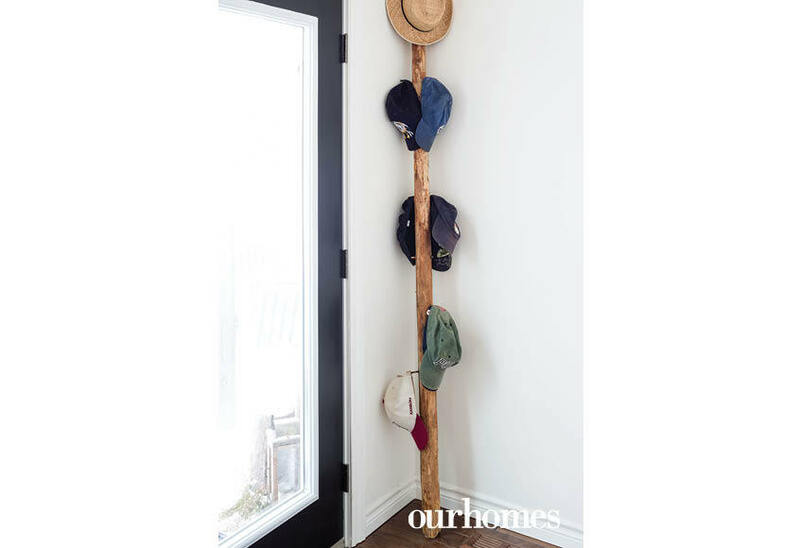 Just inside the front door, a debarked wooden pole is a place to hang your hat. Decorative pillows, woollen throws and rugs, add elegance, colour, texture and cosiness to the space. 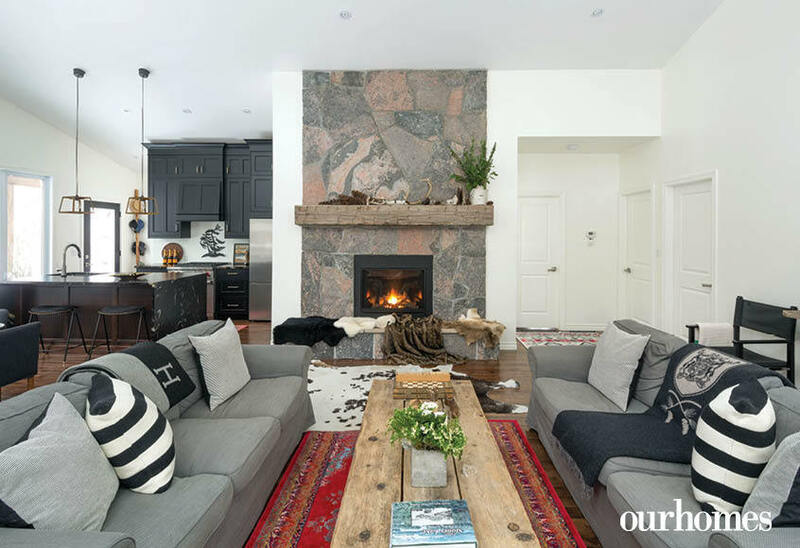 The owner enjoys juxtaposing styles, textures and vintage in her home furnishings. Old fence boards from the family’s ranch were used to build a living room console. They topped it off with handmade lamps and a canvas painted in a Hudson’s Bay Company motif. Stonemason Barry McClennan built the living room fireplace and hearth. Boards from a builder’s scaffold were repurposed to make the coffee table. A surfboard is plastered with stickers from the many places the couple has visited. A display of fishing lures adds another pop of colour. The kitchen includes black cabinets with brushed gold hardware and leathered granite countertops from Delray Granite. 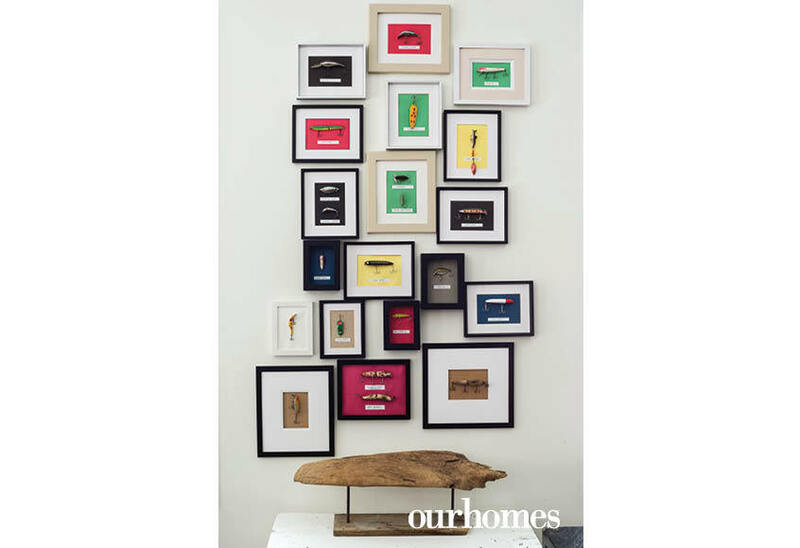 A colourful collection of framed fishing lures makes a visual hook on a kitchen wall. High windows in the master bedroom bathe the sleigh bed in natural light. Doors open to an exterior deck. 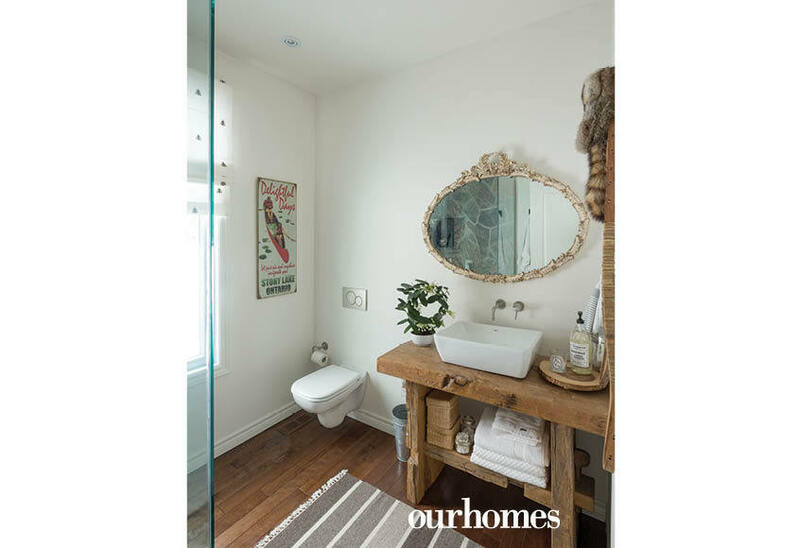 In the main bathroom, snowshoes, a Davy Crockett hat, a reclaimed French renaissance mirror and a rustic bathroom vanity made from barn beams share the space with modern fixtures like a wall-mounted toilet and a large, custom glass shower clad in indigenous granite. 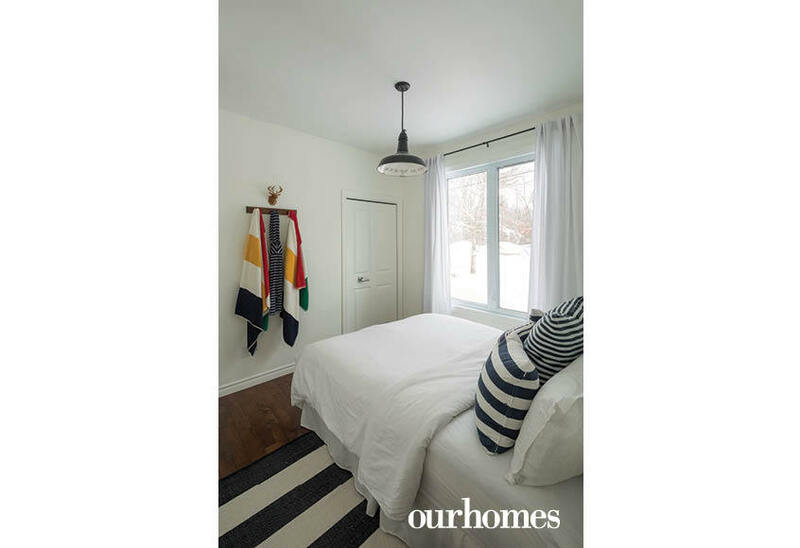 Black-and-white stripes in a simple guest bedroom continue a theme from the rest of the home.